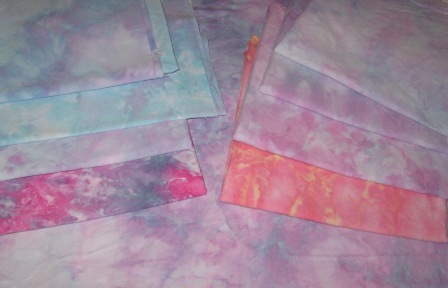 Back in April, before my little visit to the hospital, I got some fabric dyed in the snow. Here are my results. I have many pale blue and purple ones because I used all I had in my sales box. I wanted to replace it all. I also have one larger piece (60x80) to use as a backing on a lap quilt. It turned out great. I am pleased such a large piece turned out so well. I was kind of hoping for snow in May (got lots last year). Then I could snow dye again. I have my bedding plants bought and plan to get them in the ground Saturday, so now I really do not want snow till December.